So after the disaster with the stripper (I couldn't figure out a way to say that without it sounding bad), this table was busted. Just awful. The finish was terrible, uneven, and had deep groove marks where I tried my hardest to sand off the old finish. So, I thought, maybe I'll just paint it and you won't be able to tell, well I was wrong. The gray paint seemed to hi-light those unsightly grooves and the uneven finish like you wouldn't believe. I was discouraged but we needed a table so I brought it back inside and tried to make it work. Here's what it looked like after a little paint. You really can't tell it from the picture, but just trust me, it was very noticeable in person. 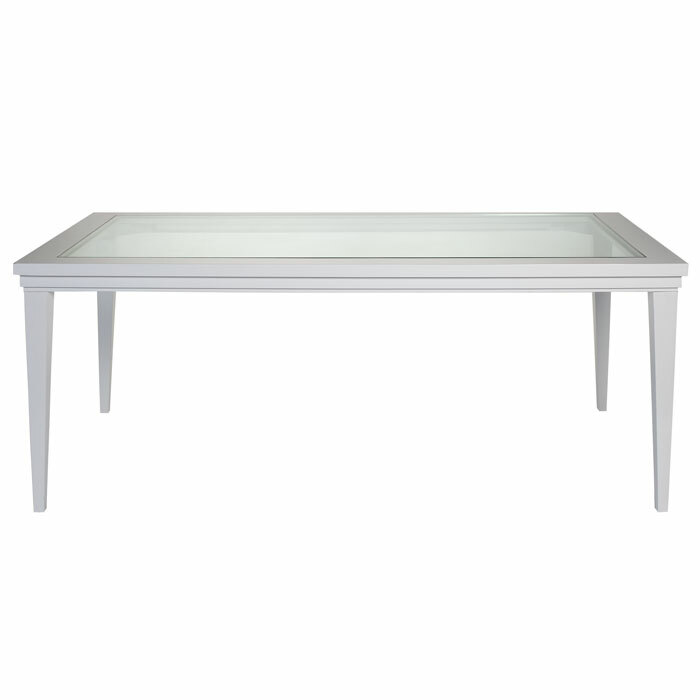 I was so close to just putting this table by the side of the road and letting someone else worry with it, I wasn't even sure it was worthy of Craigslist, but I had a lightbulb moment while wandering around at Zgallerie (actually looking for another table) I saw this table and realized it would be the perfect inspiration for my busted less than perfect table. I loved that the top was glass because that would mean I could eliminate the large areas that were damaged and only have to deal with getting the outer border smooth and even. There was hope! 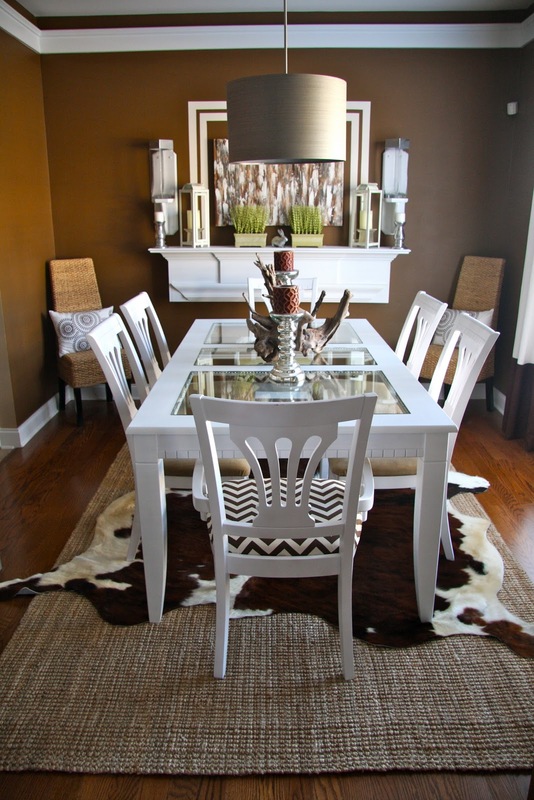 The idea of glass also appealed to me because that meant it would showcase my cowhide rug that was hidden by the wood before. I don't have a router (although that's on my birthday list) and didn't want to mess things up anymore so I called our friend who is a carpenter and explained what I wanted to do. So, he cut three rectangles out of the top and created a lip wide enough for my nailheads. We had three separate sections cut out so that we could still remove the leaf down the road if need be. I actually like it better that way too because it breaks it up and creates more areas for the bling of my nailheads. 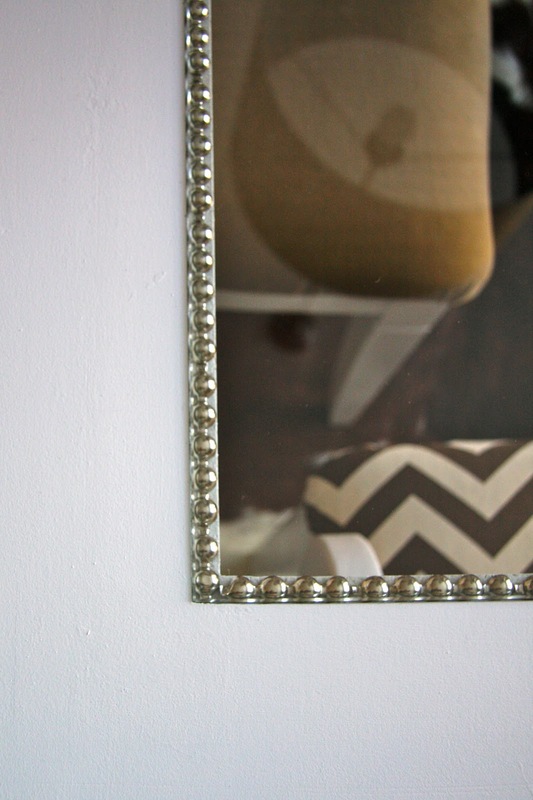 I ordered nailhead trim from this Ebay seller, it was the best price I found. If you've never used this before, it's amazing! You only nail every fifth nailhead which makes it 1,000 times easier to get it straight. I drilled a tiny pilot hole and used a nail punch to hammer them in. 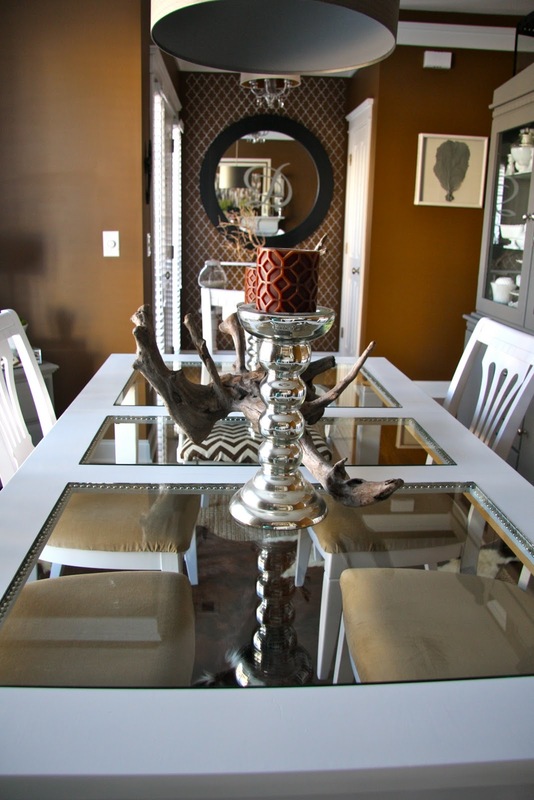 Then, we ordered some glass from a local glass shop and now we have a beautiful, functional dining room! At last! WOOOOOOOOOWWWWWZA that is AMAZING!!! I am so impressed. I learn to much about stuff in blogland. I never knew of these strips! I could totally see myself using these for a project. Way to stick to it and get it done. You guys rock!!! WOW! I would've never even imagined you could do this. I am totally loving it. You did a great job! I would have never thought of that but it's gorgeous! That table is totally hot. Love the whole room. Oh Glorious Day! That looks great! I actually like yours better that ZGallery! Way to go! This is B.E.A.U.T.I.F.U.L! Doesn't it feel great to have a one of a kind piece?? I'm enamored by this. Great job!! Wow, that is so creative. It looks fantastic. AWESOME! I'm going to have to pick up my jaw off the floor after seeing this! Seriously - WOW! See, you just had to follow that path of frustration to get to the fabulous end result. Worth all of the pain in the end, right? ;-) Well done!!! Oh my word, your table is awesome! I love the nailhead trim, you were are smart! !I think it is so much better now. That table is fantastic! I mean super gorgeous,and the whole dining room is just fabulous. I am floored. That's quite a light bulb moment! Genius! It looks so gorgeous and perfect in your space! Holy butterflies! this DIY rocks...you've out done yourself, I love love love that table. Wow...almost utterly speechless at the transformation! It's a lovely table now! Really great makeover! So HAPPY you finally got to post this! LOVE IT!!! Incredible!! I can't believe it's the same table. I am back and OMGosh almight please come link that beauty up at my Linky Love Friday party! I would be honored to have it on there. It is such a beaut I had to come comment twice lol!. What a save! At first I thought the grey finish was the after shot and I was all "oh". But wow! What a magnificent end piece! It's a thousand times more beautiful than anything I could've imagined! Great job! OMG! This is amazing! Stunning! My heart skipped a beat when I saw the final product! I am 100% inspired to find a old beat up table on craigslist and turn it into something spectacular. What a creative solution to your problem. Well done! Best before and after I have seen in a while. This is by far the most amazing table transfiguration I've seen! I am completely head over heels for this! I can't imagine it would be that difficult for anyone to do if you knew someone who had the right tools! Think of all the amazing color options for the table! This would be a great project for end tables/night-stands, etc. Thanks for sharing! Totally gorgeous! So glad you could save it, and it is WOW! Wow it looks amazing. I have loved that ZGallerie table for a while now, but this is better. Great Job! you are AAAMAZING! that is so freaking beautiful <3 awww i wish i had your dinning table in my house. This is a prime example of why bad things happen sometimes! Seriously your table is to die for! This is probably your best do over everrr!!! Have a great weekend! It looks spectacular! All your brain storming and hard work paid off. I'm glad you worked with what you had and problem solved to get this fantastic result because it's design inspiration for us all. Well done! Job well done! Great forsight as to what could be! Enjoy! Absolutely gorgeous! What an incredible save! You inspire me! oh WOW. That is perfection!! Love it! I love this! You are brave to cut into your table top! Congrats it looks amazing! Fantabulous!!! I LOVE your after table!!! You are so lucky to have soemtone that you could call for help, too! Hope you're serving a wonderful meal on the table to say thank you!!! Brycie is my cousin, so I found your blog through her and I love it:)!! Wow, that table turned out AWESOME! So beautiful :) Can anyone go wrong with nailheads, anyway?! 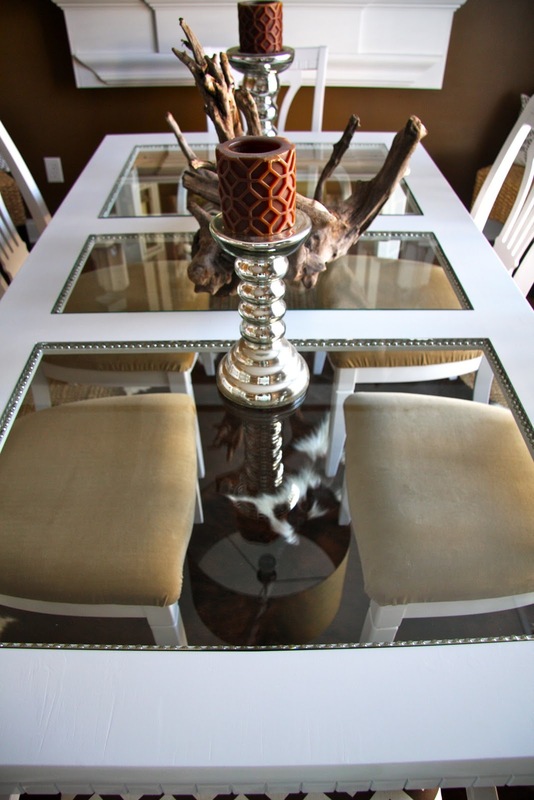 I was so in loooove with your table, that I posted it on my blog. Let me know if you like it or not. Amazing! I love nail head trim and had never seen it used like this. Just amazing! This room is GORGEOUS! what a perfect job! My favorite part are the rugs...Love em! Saw this on Better After. This is phenomenal. Not enough words to tell you how gorgeous this is. Incredible makeover!!! The whole room turned out great. I love all the layering and texture. Phenomenal job! I would have never thought of nailhead trim and It's absolutely perfect! THat is freakin' amazing!! I'm in, consider me your newest follower! Great Job!! This turned out beautifullly. WOW! all of it! WOW! great job! Oh. My. Gracious. I LOVE YOU! Ive been debating on whether or not to attempt painting a really well-made "vintage" dining set that we inherited but Ive been too chicken. I want to do it white and now you've given me a good inspiration. This is beautiful. Im so glad you sent it over to Better After so you'll get some new readers. 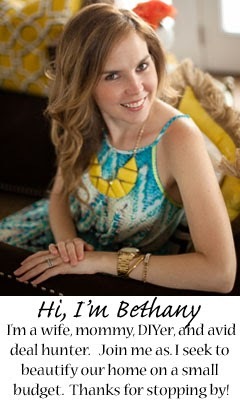 DOnt forget to come over to my blog for a week of fun giveaways! Love the new dining room. Where did you find the shelf on the back wall? It almost looks like a fireplace mantel. Hey Doll, I just wanted you to know I featured this amazing table makeover on my blog today for my fave pick from my Linky Party last week. It is amazing of course I told you that like 4 times now lol!. You have another amazing project with your ruffled chair. You should come link up again :) Happy to have ya. Holy Mother of God....that is BRILLIANT! Unbelievable. It looks awesome and that is why I shop...to get inspiration! Proof! OMG, I love this! you are sooooo creative! I have a very similar table but it is brown, with 2 glass squares, I think I will try this with the nailheads to add a nice touch. I've been wanting to change my table but this may step it up a notch. Very beautiful, wonder if you could do something like that with a paneled old door? Hummmmm. Oh oh! First of all, can I just say, I love everything about your dining room! What a beautiful space. The layered rugs are awesome. But the show stealer is that table; absolutely beautiful! Such a brilliantly creative idea to borrow the style from zGallerie - personally, I like yours better. I definitely would not have seen the potential in that table and would have passed it up at a thrift shop (I'm trying to learn), but you have created such a gorgeous piece of furniture. Beautiful job!